Some southern parts of New Zealand has been great places for southern lights hunting. A few examples would be Christchurch, Lake Tekapo (covered below), and Stewart Island. But the lights have visited Queenstown, over the banks of Lake Wakatipu. Vibrant colors of greens and reds danced across the night sky on multiple occasions in 2017. Even people in Auckland could see this light. This happened because the sun blasted off some materials and impacted the earth’s magnetic field. Some southern cities of New Zealand got to witness this rare, beautiful night sky that probably won’t come back in 5 years or so. If you want to see aurora australis from the city, you might want to wait for a while. But don’t worry, you can still see southern lights somewhere else. Because of its beauty, this city is sometimes called “Paris of the North”. You won’t be only amazed by the northern lights, because this city also has beautiful scenery, magnificent fjords, and Lyngen Alps. Additionally, the coastline of Tromsø has surprisingly moderate temperatures, thanks to the Gulf Stream. You can see spectacular view of aurora from Ersfjordbotn, a village located 12 miles (40 minutes) from Tromsø. It’s in a countryside between snow mountains and a fjord, a lot of sightseeing when it’s not dark. Visit this place from mid-September to late March to get the best of your aurora-hunting trip. The best place for aurora hunting in Australia is definitely Tasmania, an island in the south of the continent. Australian Antarctic Division of the Department of the Environment and Energy estimates that seeing aurora australis in Tasmania is 1 and 2 percent, with the odds increasing near equinoxes in late March and September. The one spot to see frequent light event, however, is in Mount Wellington. It’s a mountain in the backyard of Hobart, Tasmania’s capital city. If you get to the 4,100-foot peak, you’ll likely to be in the most perfect, unobstructed place to witness one of nature’s bewitching beauty. This Scottish highlands park is the largest national park in Britain with a vast, dark sky. It’s also one of the best places to see northern lights in the country. You can go to either Dava Way above Forres or Glenlivet Estate to enjoy the night and the display of colors in the sky. Other activities that you can do here are snowsports, hiking, and golfing (there are 12 golf courses here). If you like dog-sledding, perfect. Cairngorms is Britain’s only sled dog center. Oh, and if you want something more challenging, go to the bridge-based bungee jump here. The best place to see aurora australis in Australia would be in Tasmania. But yes, you can also see it without crossing the strait. Simply head to the southern coastline of Victoria. When the conditions are right, you can sit and watch the dazzling sky over the Bass Strait. Alaska itself is breathtaking and beautiful (as shown in this film). 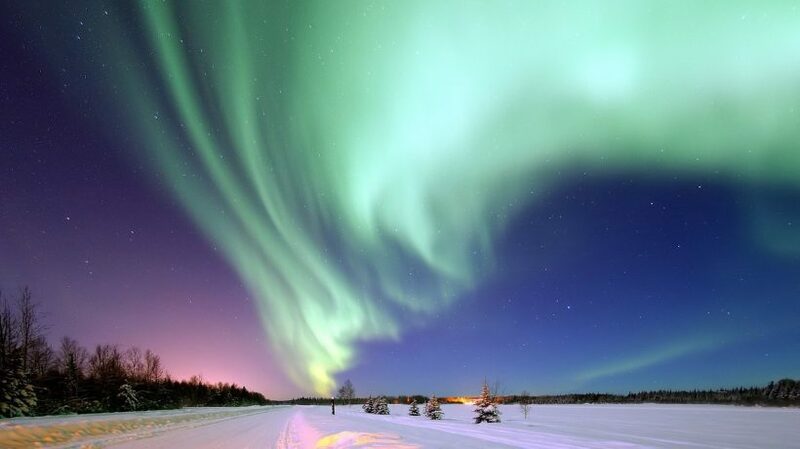 But here in Fairbanks, you get the best place to see the northern lights in U.S. It has a forecast system and has tours to take visitors far from the light-polluted areas. Fairbanks is close to the international airport and Denali National Park. It’s best to go there late August to mid April. Just note that Alaska is cold, and it can be a challenge to hunt northern lights there. To reduce the cold and fatigue, you can enjoy the view while warming yourself in a hot spring. Find spring-fed hot tubs in the village of Manley Hot Springs. Before anything, let me tell you that South Georgia Island has a harsh weather. But if you’re brave enough to conquer the below-zero temperatures and howling winds, the endeavor will be worth it. If you can, you’ll be able to get a lot of Instagram-envy pictures (if your hands are steady enough, that is). To get the best view of aurora, you have to reach far south of this snow-coated continent, and only research vessels that do this. However, there are also frequent sightings that occur during the end of cruise season in March. This time is great for seeing humpback, sperm, and killer whales. This settlement is the only place that has an international airport in Greenland. This area has 300 clear sky days per year, a great location for aurora hunters. If you’re lucky, you can even see the northern lights from your hotel room in Hotel Kangerlussuaq. Just keep your curtains open. You can go to Arctic Circle for short northern lights tours or you can go in February to April to enjoy 3-day dog-sledding expedition to Sisimiut. If you head south of Greenland like Qaleraliq Glacier, you can also see beautiful auroras and attractions such as floating icebergs. UNESCO recognize this lake as a “Dark Sky Reserve” because of its little to no light pollution (there are restrictions to keep it that way). The area is really dark, which makes it a great place to go stargazing. Moreover, the cloudless skies allow a spectacular southern lights display. If you’re a backpacker and/or a camper, you’ll be in love with this lake. The best time to visit this lake is from March to September. Aside of the lake, you can also step inside an observatory on Mount John to observe night sky with a telescope and appreciate the wonders of the night. Thanks to its northern latitude and low light pollution, the Yellowknife of Canada is the perfect place for aurora viewing. You can stay at Aurora Village, which is 25-minute drive from the city center with specially designed heated viewing chairs. You might never thought that you can see aurora in Argentina, but apparently you can. You can see southern lights in Falkland Islands and Ushuaia. It’s quite the spot for the light show that there’s a permanent aurora monitoring system. Also, you can see penguins and elephant seals at day. The best viewing months are April through August. On the other hand, Ushuaia is easier to get to. The city has its own airport and a lot of places to stay. You can do many things while you’re in town as well. Just a note, though. This city has a frequent bad weather that ruins your chances to see the southern lights, so plan a multi-day visit.